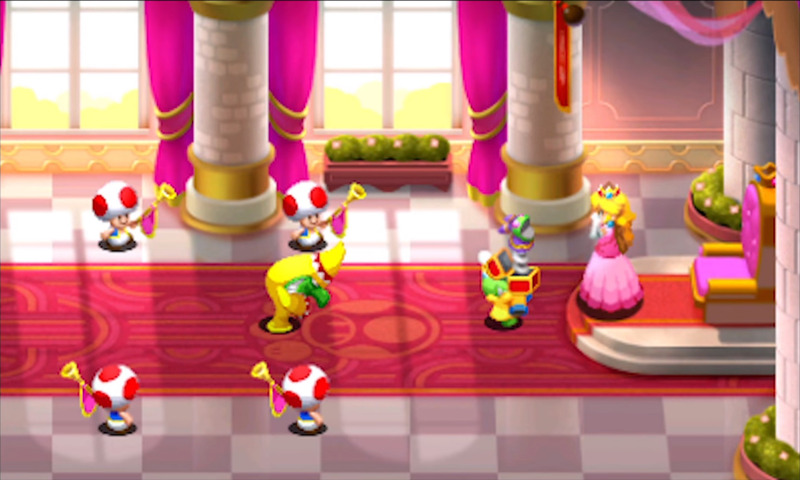 When Nintendo announced a Mario and Luigi: Superstar Saga remake for the 3DS, I wasn’t sure I needed it. The beautiful 2D art, laugh-out-loud dialogue, and blend of action- and turn-based RPG gameplay of the Game Boy Advance original still feels every bit as vibrant and engaging today as it did when it came out 15 years ago. But after playing through Mario and Luigi: Superstar Saga + Bowser’s Minions, I’m absolutely convinced that it is the definitive way to experience one of Nintendo’s best RPGs. The premise is the same: The evil witch Cackletta and her talkative minion Fawful have devised a scheme to conquer both the Mushroom Kingdom and the neighboring Beanbean Kingdom, starting with turning Princess Peach’s voice into an explosive force. Bowser, angry that he can’t abduct Peach in this state, teams up with Mario and an (unwilling) Luigi to give chase in an airship, only for the brothers to crash-land in foreign territory. Mario and Luigi must brave the strange lands of Beanbean to stop Cackletta’s plan. And while that’s going on, Bowser’s armies are on their own quest to figure out just where the heck he vanished to. While the core game remains the same, the already great visuals get a gorgeous update on 3DS. The art has been completely redone, from the core sprites of Mario and Luigi to the tiniest of background details, and the result is some of the most beautiful and vibrant 2D art around. Various character animations have also been touched up and expanded upon, giving the brothers and their foes a lot of extra personality through their movements. (Sit back and watch some of the duo’s idle animations during combat when you have a spare moment– – it’s a real treat.) The music has also been revised and expanded, with longer melodies and higher-quality instrumentation adding an additional spring to the step of the bouncy, energetic tunes from ace composer Yoko Shimomura. The only disappointment in the audiovisual department is the complete lack of a 3D option. We’ve seen how good other “2D- art- in- 3D” games look on the 3DS, and given that the game has its fair share of perspective and platform puzzles, it would have been both a big help and a great visual enhancement. 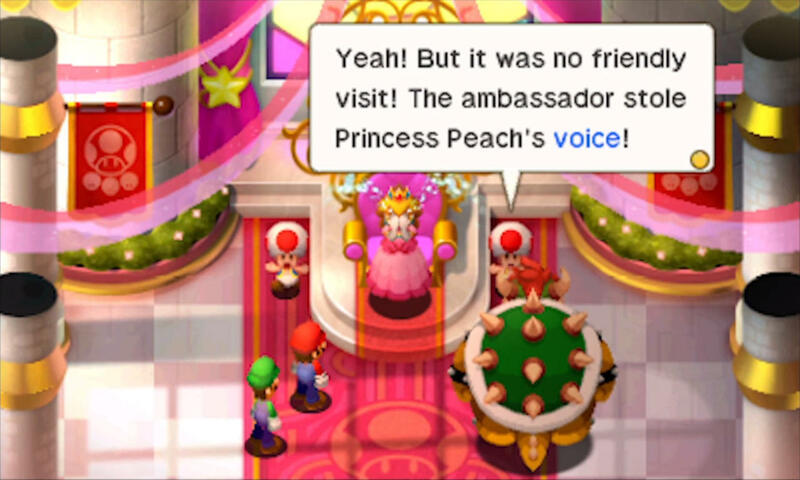 The silly story of Superstar Saga is brought to life through dialogue and events that evoke the whimsical, humorous nature of the Mario universe. Characters like the elegant Prince of the Beanbean Kingdom and the wicked Cackletta have memorable quirks that make their personas stand out. Even some of the more minor side NPCs, like the Chuckola Bros, have a notable amount of care and attention put into their speech. That still shows through after all these years–though the most memorable character, Fawful, doesn’t have quite the impact he once did, coming off an era where nonsensical JRPG translations were common. The core gameplay remains primarily the same as the original game, with a few enhancements. You explore various environments from an overhead view, using special skills to navigate and solve puzzles when necessary. When you encounter an enemy, you enter a battle sequence that blends turn-based commands with timing-based button presses to both deal extra damage to enemies and evade or counter their attacks. Some subtle improvements from later games in the Mario and Luigi series have been added, too: The pair can now perform an emergency guard during combat by pressing the X button, reducing damage from enemy attacks if you’re not confident in your evasion skills. You can also retry boss fights on an easier difficulty if you get a game over. Story scenes can be sped up by holding down the R button, making some of the dialogue-heavy scenes zip by faster if you’ve seen them before (or if you’re a speed reader). These additions help streamline the experience, but by and large, if you remember the events of the original Superstar Saga, you’re going through the same motions in the remake. Most the brand-new content is in a sub-game that opens a little over an hour into the main story. Called “Minion Quest,” this is a separate adventure with no bearing on the main story that follows a gallant Goomba who wants to find and rescue his Lord Bowser. To accomplish this, he needs to find other minions from Bowser’s army, convince them to band together, and fight against Fawful’s brainwashed hordes.